The Beatles with Brian Epstein en route to Manila, Philippines, 4th July 1966. On July 4, The Beatles held two sold out concerts at the Rizal Memorial Football Stadium with a combined attendance of 80,000; the evening concert registered 50,000 paying audience, being rivaled only in size by the concert The Beatles gave at Shea Stadium in New York on August 15, 1965. Such record-making statistic though was supplanted by the succeeding events owing to a fiasco that happened earlier in the day. 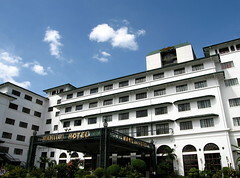 the party, a delegation came to the Manila Hotel to collect The Beatles. Brian Epstein, The Beatles' manager, declined the invitation on the grounds that no earlier arrangement had been made and The Beatles were still in bed. Manila Hotel where the Beatles stayed. The day's scheduled concerts, however, later proceeded successfully. In between concerts, local televisions reported the alleged snub showing footages of children, some crying, disappointed by The Beatles. Epstein watched in horror and went immediately to the television studio to apologize and set the facts straight. But barely had he started reading his press statement when the transmission blipped. Newspapers carried the headline, Beatles Snub President. 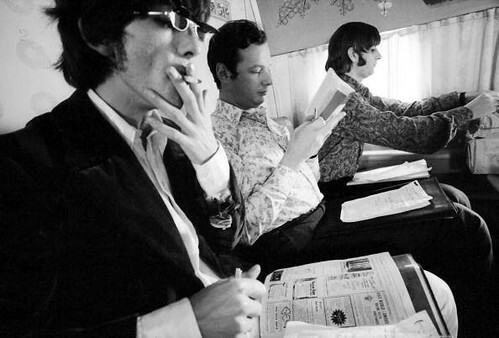 The following morning was the scheduled departure of The Beatles to New Delhi. Suddenly, The Beatles and their entourage realized they were practically on their own without any help: Room and transportation services were withdrawn. In the airport, the whole Beatles entourage was manhandled as it made its way to the plane. All in all, the Beatles performed 11 songs in their Manila con-certs. They opened with the Chuck Berry original Rock and Roll Music and followed it up with 10 original Beatles compositions: She’s a Woman, If I Needed Someone, Day Tripper, Baby’s in Black, I Feel Fine, Yesterday, I Wanna be Your Man, Nowhere Man, Paperback Writer and I’m Down. This repertoire of less than a dozen songs basically went unchanged throughout the Beatles’ tour of Germany, Japan and Manila. In fact, the Beatles performed the same standard set when they toured the United States for the last time in August 1966, a month after the Manila nightmare. From time to time, The Beatles deviated from this set by taking on Long Tally Sally instead of I’m Down as closing climax. On few occasions, they played both. Encore performances were probably not yet in vogue then, because whenever Paul introduced the last song with the line Our next number will be our last number . . . , it was indeed the end of the show. Straight from the platform, The Beatles, as a rule, proceeded immediately to a waiting car parked nearby for a swift exit from the concert arena. On July 3rd, the day prior the show, The Manila Sunday Times reported that the Beatles were invited to join the President and Mrs. Marcos (with their 3 children) to their Malacanang Palace at 11am. The Beatles knew nothing of this appointment, hearing only of a request for a short pop-in at the palace at 4pm which they respectfully declined due to the fact that their first show started at 4pm! The Beatles claimed they never received the earlier 11am invitation. Much to the Beatles surprise, the palatial tyrants were extremely angered at the Beatles neglect and the morning after the concert, The Manila Times ran the headline Imelda Stood Up!!. The ramifications were to become serious. 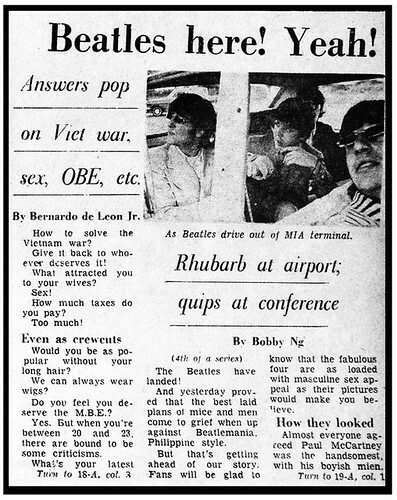 Philippine promoter Ramon Ramos refused to pay the Beatles for their performance! Bomb and death threats were telephoned to the deluged British Embassy and to the boys hotel suite. Brian Epstein was so distressed with the situation he arranged for a press conference from the hotel to apologize for the misunderstanding. BUT...as fate would have it, some unforeseen static blipped out his interview from most all TV screens in the country! (more than a few thought it was probably more shenanigans by the Marcos clan). When they finally approached the plane, a large booing crowd jeered and mocked them chanting Beatles Alis Dayan! (Go Home Beatles!) Once in the plane, some scraping government officials decided the Beatles were NOT authorized to leave the country due to inaccurate check in procedures days earlier... This led to another 40 minute wait on the Tarmac while Mal & Tony Barrow went back to the terminal to clean up the necessary paperwork. 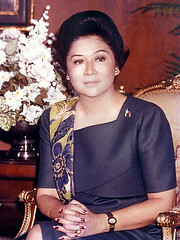 Only minutes after the Beatles angrily departed, did the press run a statement by President Marcos stating There was no intention on the part of the Beatles to slight the first lady or the government of the Republic Of The Philippines. Obviously a bit too late to do the Beatles any good.